Longer. Softer. And more amazing than anything you’ve ever played. There’s no question that Duo is a true performance double take. It’s the longest ball Wilson has ever made and the softest ball on the market. Its true performance value and distinctive feel set it apart from every other distance ball. 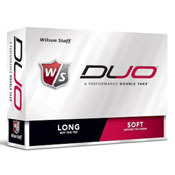 Tried new Wilson Staff Duo on 9 holes. Great feel and muted sound. I play Pro V-1x but this is great, four GIR, one birdie. Length off tee and soft feel made long par 4's reachable. 1/2 price of Pro V-1 is a bonus. I'm 72 with 18.3 index. (65+) and your distance is not what it used to be.......this my friend is the ball for you. Feels great, goes long, and best part of all decent spin off the irons. What a God send for us older gentleman. Look out flat bellies....gonna be right up there with you now! My 25th birthday was two weeks ago. My family normally treats this special day as a week long event. This time, Mummy was placed in charge of birthday presents instead of Thomas, my loyal servent and caddie. It goes without saying that Mummy has no clue when it comes to golf equipment and that would include golf balls. After accepting my larger presents that included a new E-Class Benz and several Lauren suits, I was a bit put off by her choices in golf-related purchases. One of these was a box of Wilson Duo golf balls. Wilson? I had never previously uttered the word. Later that afternoon I joined Biff and Louis at the club. After a lavish lunch and a nice single malt scotch we headed to the first tee. We set our wagers and proceeded to announce our ball type and number. I told my fellow brethren "Look chaps, I'm playing a Wilson Duo #3 today. What a gas!" This statement was followed by several gut-wrenching laughs and a few looks of disgust by the starter. I expected nothing. My first drive was a towering shot with a slight draw that bounced and then skittered across the fairway at a rapid pace, coming to rest approximately 285 yards from the tee. Biff was aghast and Louis looked to be turning a pale shade of white. This was only the first drive of many i hit that day over 285 yards. My longest was 325 yards. I would highly recommend the Wilson Duo. Such balls are normally beneath me but in this case I have no explanation. I have since bought an interest in Wilson and I shall be making an appearance at the next shareholder meeting. Wilson Duo. Not the name I'd pick but a competent ball nonetheless. To be put on hold? I think not. Henry Griffits Platinum Membership irons. I used to only play Pro V 1x. Now, the only ball I will ever play again is the Wilson Duo. It's half the twice and a much better ball. My drives are 30 yards farther and I have ha to switch my irons at least a whole club length. Most importantly, I have shaved 7 strokes off of my game!! No question. I will never play any other ball. Without a doubt the best buy on the market today. This ball is long, soft, great feel off the putter, durable and cheap. Wilson has a true winner here. The Titlists Guys should be nervous about their DT Solos, NXT's etc. sales. Once a golfer tries these balls they won't go back. I have three dozen NXT Tours I would like to sell. NXT Tour, Bridgestone E6, Callaway Warbird, Nike Vapor. Wilson Duo golf ball has restored my golf game...gained atleast 40 yards on my driver and I'm hitting irons into greens that I hit back in my 30's...no joke...best ball I ve hit in years!!!!!! Ball is soft around the greens ..putts roll true and smooth yet jumps off the driver.........thanks Wilson......A deffinate buy for me..try them but don't tell your playing partners ...just enjoy pounding it past them!!!!!!! It is a nice ball distance is good and yes it is soft. Stops on the greens great and putts super but the soft part you will have to get use to.I will write another review when it warm up and the damn rain stops ..lol winter golf got to love it. about all distance balls ,,, but remember it is soft.